In one month alone, 45 patients turned up with injuries from bouncing – most of whom were under 10 years of ago. DOCTORS HAVE WARNED that children are at risk of injuries from trampolines and bouncy castles as the weather gets warmer and more time is spent outside. In one month alone, 45 patients presented at a clinics around the country with bounce-related injuries, almost half of whom were under 10 years of age. The vast majority of the injuries were sprains and breaks of arms and legs. Dr Brian Gaffney, the medical director of VHI SwiftCare Clincs, said doctors weren’t trying to be killjoys but at parents should take care to minimise any potential accidents. “We wholeheartedly support children playing outside and staying active, but year on year we see an increase in these types of easily avoided injuries as more parents invest in trampolines or hire bouncy castles for communions and birthday parties,” he said. Children can suffer a nasty break which can be traumatic for everyone involved. We are calling on parents to take a number of straightforward precautions with a view to minimising bumps and bruises and reducing the number of these type of injuries we treat this summer. He advised adults to supervise children on trampolines, to make sure bouncy castles aren’t wet before children start playing on them, and to make sure that only a small number of children use the trampoline or bouncy castle at any one time, and aren’t wearing any shoes or sharp items. 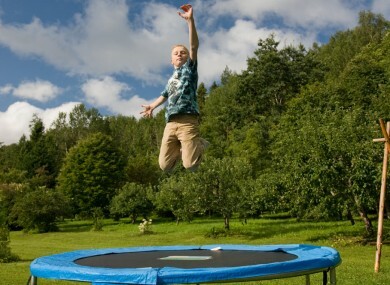 Email “Trampolines and bouncy castles can be a danger to children, warn doctors”. Feedback on “Trampolines and bouncy castles can be a danger to children, warn doctors”.